Hi! I’m John. I’m an Englishman living in West Wales with an interest in things mechanical or technical. I don’t consider myself to be an engineer. More of a confident fettler. I don’t own any modern motorcycles and, it occurs to me that, I have probably not ridden anything made after 1980! Although I have flirted with the idea of getting a modern lightweight bike, I know I would just get another “oldie” if the cash was available. I don’t need a ‘bike for daily transport and there are just too many interesting old machines. “Rhino”. A 1972 Moto Guzzi V7Sport. 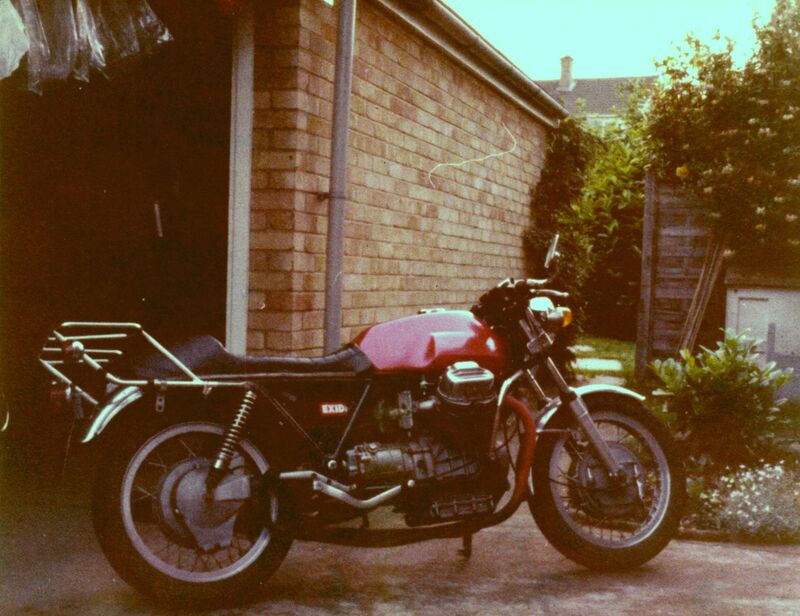 The initial reason for this blog was to record the rebuild of the 1972 Moto Guzzi V7Sport that I’ve owned since 1978. The bike was sold new in Germany and imported and UK registered in March 1976 by its RAF owner who immediately sold it. I bought it 2 years later after seeing it for sale in my home town of Ipswich. I paid £750 which was a lot of money back then and sold my much newer Yamaha RD400 to partially cover the cost. It was 6 years old and in a well-used condition with its worn but original lime green paint work rubbed through to the silver base coat on the tank. It was fitted with a two-into-one exhaust system and one of the exhaust valves was damaged. A flame would shoot out of the straight-through “silencer” when the throttle was closed as it popped on the overrun. The Kph speedometer worked but the odometer didn’t and had apparently been stuck at 45920Km for a number of years. The bike was my main form of transport as I didn’t learn to drive or buy a car for a few years. I joined the Moto Guzzi Club GB and attended one of their early V-twin rallies. I also belonged to a local ‘bike club in Ipswich. “Bike 76” I think it was called. I was always going on about how great my bike was. It was “my V7 this” and “my V7 that” and I became known as V7John, the name I have used in motorcycling circles ever since. During that early period of use the dodgy valve was replaced and I painted the bike metal-flake red using aerosol paint. It gained a Dresda twin headlight half fairing and like that was flogged around the UK and Europe. My situation changed and the bike wasn’t being used much by the mid ’80s. After a period standing idle it was persuaded into life and ridden a short distance before the oil pressure light came on. I dismantled the engine to find that the chrome had flaked from the cylinder walls and bits had gone everywhere they weren’t wanted. I had the crankshaft reground but didn’t have the money to do any more and the dismantled bike was stored away still showing 45920Km. In 1992 years I moved to a new job in Wales. The still dismantled remains were stored in my trailer in a friend’s barn. When I came to collect it I found it had been moved outside and everything was sat in half an inch of water. The reground crank, being heavy, was at the bottom, partially submerged and was ruined by rust but, this time for good. I used it as a garage doorstop for a while. Having a young family meant there was still no spare money for bikes and, besides, I was spending my time keeping old but interesting cars on the road. It wasn’t until 2002 that I decide I would make a return to motorcycling and this would be aboard my old Guzzi. I was aware that the V7Sport was now considered something special but major engine parts were getting hard to find. I bought a complete used 850 engine in Bristol and fitted that instead. The old exhaust was now dust but I had some T3 exhaust headers and found some original Silentium silencers at a show. A few bits were re-chromed and I painted the lot black as that was easiest. I bought an MPH speedometer at an autojumble and found myself back on 2 wheels in June 2002. Although the bike was made in 1972 the idiosyncrasies of the old UK registration system meant the bike received a 1976 registration number as that was the year it was first used on UK roads. This led to me being accused of owning a V7Sport replica. Also by now, the rules for allocating registration numbers to imported vehicles had changed. They no longer could be allocated a number that made them look newer than they really were. This meant I was able to correctly re-register the bike, at no cost in July 2006. No longer NNH694P, now WDE97K. Disaster struck in April 2007 when I left a mountain road and the bike was damaged in a fairly heavy accident. Once again it was dismantled and stayed that way until early 2014 when I started my blog. The 850 engine had been put to use in the basket case Guzzi 750S3 I had acquired and, in turn, the crankshaft from its seized engine was used as the basis for the rebuild of the original V7Sport engine which by now had lay in bits for more than 25 years. The rebuild of that engine and the gearbox overhaul aren’t covered in my blog as they’d been done a year or so before. Generally I like an old bike to have a patina of age but, on this occasion, the amount of damage meant something close to a restoration was needed. This rebuild, most of which is covered in the blog, was completed in February 2016 and the odometer reset to zero. Originally I said the aim wasn’t for a shiny showpiece but something that could be ridden and enjoyed. Despite these sensibly good intentions it has all turned out very shiny indeed! This won’t, and hasn’t, stopped me riding (and enjoying) Rhino in all weathers. However, it has encouraged me to wash it more! 1976 850-engined Moto Guzzi 750S3. “Rhino’s friend”. 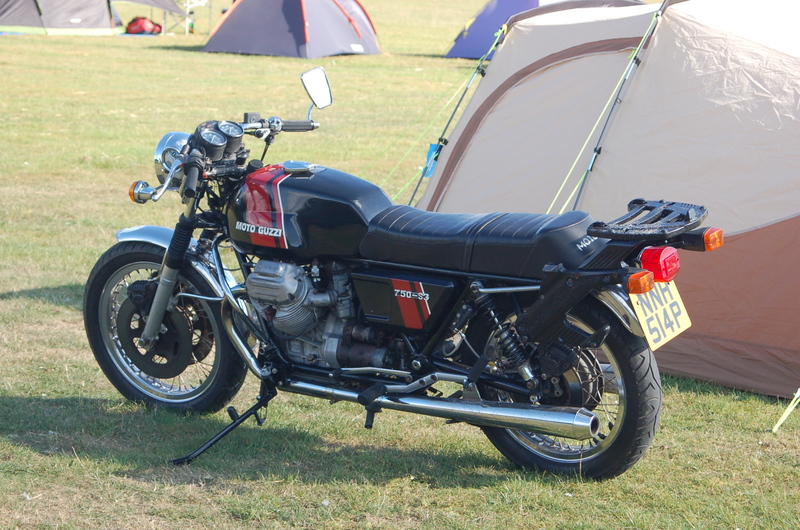 My blog also refers to the 1976 Guzzi 750S3 which I had bought as a basket case just before my 2007 accident on the V7Sport. It was clear an electrical fire had led to the bike being dismantled then left for number of years. The engine was now seized and a few parts were missing. I had originally intended it to be a long-term restoration project but, instead it was reassembled using a mixture of S3 and V7Sport parts plus the 850 engine removed from my crashed bike. This was so I could continue to ride. A bit of new paint and it looked very presentable. This S3 mongrel turned out to be a very nice bike. I loved the linked brake system and it was just so reliable. It appeared from time to time in the blog as “Rhino’s friend” but, was involved in an accident when a car did a U-turn out of a lay-by in front of me. It was very badly damaged, as was I. The salvage was sold back to the Guzzi enthusiast I originally bought the bike from in bits all those years before. Repairs have begun with the frame being straightened. 1972 Moto Guzzi V7 700cc. “The Fire Bike”. In October 2014, while still in plaster after the accident on Rhino’s friend I bought this old loopframe Guzzi. I have always liked these old models and the military/police V7 in particular. This one was red so what was not to like? My V7 was imported to the UK in 2013 having been released from Italian government service in 1986. These original V7 700s continued to be produced for Italian government agencies long after civilian sales came to an end in 1969. Updated, more powerful 750 models had already been produced for three years by the time this machine entered service. In fact, the 850-engined GT was introduced in 1972. It’s history prior to entering civvy street in 1986 is not absolutely clear. Due to its colour, I like to think it belonged to the Italian fire brigade, the Vigili del Fuoco. They did have some V7s. However it’s just as likely to be a Polizia Stradale (highway patrol) bike painted bright red later by some creative soul. Nevertheless, a friend said he saw me “out on the fire bike” and I like the name regardless of the bike’s history. Someone on the Squadra Guzzista forum has already suggested I could be “Pompiere Samuele”*. The bike looks very pretty and gets attention wherever it goes. Even more so now that it has been equipped to tow a trailer. It’s by no means perfect being pretty slow and has brakes that, although perfectly serviceable and good in their day, require good anticipation skills by the rider when in traffic. It encourages stately progress but is surprisingly agile for such a big lump. I love it and it’s usually my first choice and the reason my V7Sport is getting so little use at the moment. Sorry Rhino! *Pompiere Samuele = Fireman Sam.